I was giddy with excitement when the NFL announced it would be releasing an NFL Game Rewind App for iPad and select Android Tablets. Well, it’s here. Now subscribers to NFL Game Rewind can watch every NFL game on demand and on the go with the iPad, Android, or Windows Tablet. UPDATE (August 2015): NFL Game Rewind is now part of the NFL Game Pass Domestic Package. You can order or get more info at NFL.com/gamepass. In case you are new to NFL Game Rewind, it’s the NFL digital online product that let’s fans watch every NFL game on demand beginning the day after the game. The streams are very high quality commercial free versions of the actual NFL telecasts. 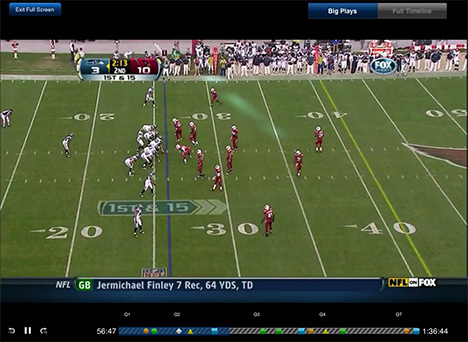 For a more detailed look, you can check out our full review of NFL Game Rewind. If you think you’ll want to watch alot of Coaches Film and/or watch all year long including playoffs and off-season, go with the Season Plus. If you just want the regular season you can get away with Season package. 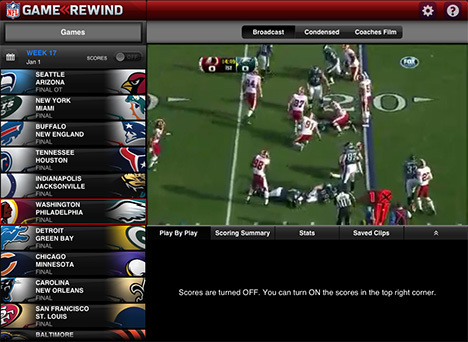 The layout of the NFL Game Rewind app is very similar to the online viewer except that the schedule panel is located on the left. Scores are off by default which I assume is to prevent spoilers. The panel below the video has play-by-play, scoring, stats, and any clips you have saved from the coaches editing mode (more on that in a bit). Watching a game is as easy as selecting it from the list on the left. You’ll find a calendar icon that will let you switch weeks or even seasons. The archive goes back to the 2011 season. (The online version goes back to 2009) While the online viewer allows you to watch one game at a time, the iPad app only allows for one game to be viewed at a time. The DVR controls include skip forward or back 10 seconds, play/pause, a scrub bar, and a full screen view button. The full screen view also has a “Big Pays” button that lets you find any scoring plays, turnovers, and other select keys plays in the game. Tap one of the icons on the timeline to see the play to which the icon refers. Green circles are TDs, blue squares are FGs, yellow triangles are turnovers, and the orange polygons are other big plays. One of the great new features added in 2012 in the Coaches Film. The Coaches Film is the high angle views from the sideline and the end zone. 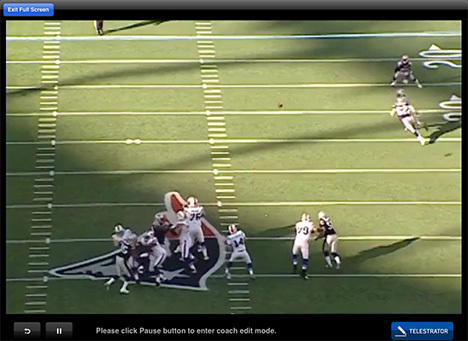 NOTE: Season Plus subscribers will get Coaches Film of every play in 2012, while Season subscribers will only get select plays. The coaches film gives you the two high angle views back to back. It’s just footage, there is no audio, commentary, or TV graphics. While in coaches film mode, select the little pen icon at the lower right to go full screen. Coaches Film mode has a play/pause button and a 5 second jump back button. The 5 second back button seems perfect for the Coaches Film. It gives you nice control over the play if you choose to watch it over and over. When in full screen Coaches Film mode click pause or he Telestrator button to use the telestrator. This allows you to draw lines, X’s ad O’s, and other symbols in a variety of different colors. Once I began using the coaches film I found myself getting lost in watching the plays unfold. Especially the passing plays. The image below is from a week 17 game last year between Washington and Philadelphia. 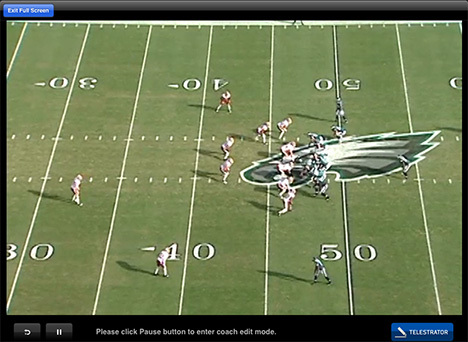 It’s a pass play where Vick hits an open Brent Celek for about a 25 yard gain. I kept rewinding and watching the play as it looked Jeremy Maclin began to break open deep just as Vick released the pass. On another play later in the game, Vick hits DeSean Jackson for a 62 yard TD. If you just watch the broadcast footage it looks like Jackson was wide open the entire time (or at least you might assume so), but by watching the coaches film you see that Jackson was double covered and broke open after Vick threw the ball. It was watching plays like this that I found completely fascinating. It really does give the fan the type of view you can only otherwise see if you are actually at the game. Below is yet another example of a play I watched several times. 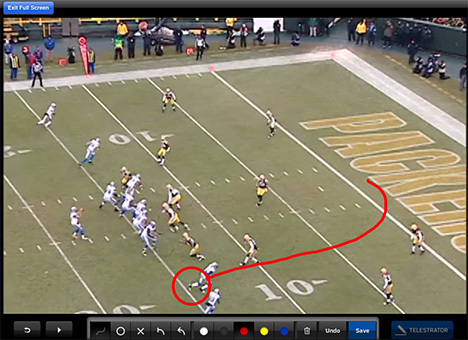 Again in week 17 of last year, Matthew Stafford throws a TD pass to Calvin Johnson vs. Green Bay in the 2nd quarter. Johnson runs a little in route and it looks like the LB for the Packers (AJ Hawk) drops back a little too deep into coverage and Stafford is able to zip it into Johnson right at the goal line for a TD. Just really cool to see the play develop from the high wide angle. The is also the end zone view which I’ve found a little harder to see the play unfold. Often times the view isn’t wide enough to see the entire field. At other times, it’s great as you can really see the play from the view of the QB or the defensive secondary. For instance, the play below gives a great view of Ryan Fitzpatrick hitting a receiver down the seam for a first down. After you “mark up” a play with the telestrator you can save the image to look at later. You can also “undo” mistakes or delete all your markups and start over. I don’t know how much “replay value” this feature will have for the average user, but it is very cool. Frankly, I could see the Coaches Film mode in this app spawning a whole cottage industry of new football analysts who break down film using this app. So far the NFL Game Rewind is pretty awesome, but there are some minor issues. First, there is no integrated Airplay. This is surprising since it was included with the NFL Preseason Live app. (This is the ability to wirelessly stream the iPad screen to your TV through an Apple TV) You can still mirror the screen to the Apple TV, but it doesn’t give you the benefit of the full screen. UPDATE (9/6/2012) – They actually pushed out an update to disable AirPlay Mirroring. If you turn on AirPlay Mirroring while using the app you get a message saying it isn’t supported and you must turn it off to continue. Wow, this is a surprise. I doubt I would have used that feature much, but I’m sure many people planned to use it this way. Also, the archives on the iPad app only go back to 2011, while you can go back to 2009 in the browser version. The third is that the NFL Network shows (Top 100 Players & NFL GameDay archives) aren’t included in the app but are in the browser version. It’s possible all these things will be added with an update, and none of these issues would keep me from purchasing the app, but you should be aware that they aren’t there as of today. Frankly, when/if they add AirPlay, it’ll be pretty darn close to a perfect app. As it stands now, it still isn’t very far off. NFL Game Rewind – NFL Enterprises LLC for the iPad from the App Store. You can order NFL Game Rewind from within the app, or order online from NFL.com.